It can be seen that analog dc ( ) maps to digital dc ( ) and the highest analog frequency ( ) maps to the highest digital frequency ( ). It is easy to show that the entire axis in the plane (where ) is mapped exactly once around the unit circle in the plane (rather than summing around it infinitely many times, or ``aliasing'' as it does in ordinary sampling). With real and positive, the left-half plane maps to the interior of the unit circle, and the right-half plane maps outside the unit circle. This means stability is preserved when mapping a continuous-time transfer function to discrete time. The constant provides one remaining degree of freedom which can be used to map any particular finite frequency from the axis in the plane to a particular desired location on the unit circle in the plane. All other frequencies will be warped. In particular, approaching half the sampling rate, the frequency axis compresses more and more. Note that at most one resonant frequency can be preserved under the bilinear transformation of a mass-spring-dashpot system. On the other hand, filters having a single transition frequency, such as lowpass or highpass filters, map beautifully under the bilinear transform; one simply uses to map the cut-off frequency where it belongs, and the response looks great. In particular, ``equal ripple'' is preserved for optimal filters of the elliptic and Chebyshev types because the values taken on by the frequency response are identical in both cases; only the frequency axis is warped. 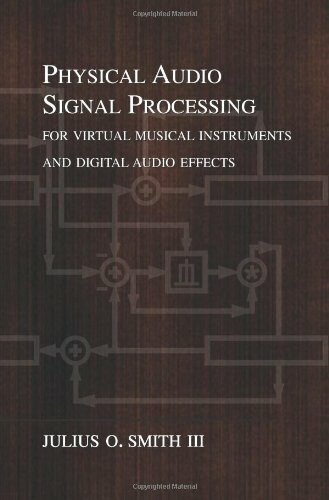 The bilinear transform is often used to design digital filters from analog prototype filters . An on-line introduction is given in . Recall that the Finite Difference Approximation (FDA) defines the elementary differentiator by (ignoring the scale factor for now), and this approximates the ideal transfer function by . The bilinear transform calls instead for the transfer function (again dropping the scale factor) which introduces a pole at and gives us the recursion . Note that this new pole is right on the unit circle and is therefore undamped. Any signal energy at half the sampling rate will circulate forever in the recursion, and due to round-off error, it will tend to grow. This is therefore a potentially problematic revision of the differentiator. To get something more practical, we need to specify that the filter frequency response approximate over a finite range of frequencies , where , above which we allow the response to ``roll off'' to zero. This is how we pose the differentiator problem in terms of general purpose filter design (see §8.6) . We see the FDA is actually a portion of the bilinear transform, since following the FDA mapping by the mapping would convert it to the bilinear transform. Like the bilinear transform, the FDA does not alias, since the mapping is one-to-one. 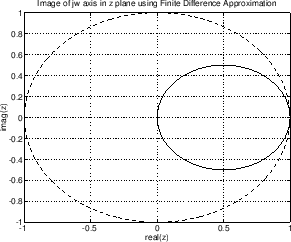 Figure 7.15: Image of the axis in the plane: a circle of radius centered at the point . Under the FDA, analog and digital frequency axes coincide well enough at very low frequencies (high sampling rates), but at high frequencies relative to the sampling rate, artificial damping is introduced as the image of the axis diverges away from the unit circle. While the bilinear transform ``warps'' the frequency axis, we can say the FDA ``doubly warps'' the frequency axis: It has a progressive, compressive warping in the direction of increasing frequency, like the bilinear transform, but unlike the bilinear transform, it also warps normal to the frequency axis. Consider a point traversing the upper half of the unit circle in the z plane, starting at and ending at . At dc, the FDA is perfect, but as we proceed out along the unit circle, we diverge from the axis image and carve an arc somewhere out in the image of the right-half plane. This has the effect of introducing an artificial damping. Consider, for example, an undamped mass-spring system. There will be a complex conjugate pair of poles on the axis in the plane. After the FDA, those poles will be inside the unit circle, and therefore damped in the digital counterpart. The higher the resonance frequency, the larger the damping. It is even possible for unstable -plane poles to be mapped to stable -plane poles. In summary, both the bilinear transform and the FDA preserve order, stability, and positive realness. They are both free of aliasing, high frequencies are compressively warped, and both become ideal at dc, or as approaches . However, at frequencies significantly above zero relative to the sampling rate, only the FDA introduces artificial damping. The bilinear transform maps the continuous-time frequency axis in the (the axis) plane precisely to the discrete-time frequency axis in the plane (the unit circle).